With the Fed continuing to pump $85 billion in liquidity into the markets on a monthly basis, one would expect the party in equities and most areas of fixed income to keep going. The big question is what happens when the music stops. The chart below is one we have shown several times over the last few years and basically compares the Fed’s balance sheet to the S&P 500. As the size of the Fed’s balance sheet increases, the S&P 500 has risen, and each time the Fed paused, equities declined. Based solely on the last four years, investors have every right to be looking over their shoulders to make sure the Fed is still there. While the outlook for the Financial markets once the Fed starts to try and exit is uncertain, we think the time for them to exit will come later rather than sooner. Going back to 1930, the average annual growth rate of the US economy has been 3.3%, but the last time the economy even grew by 3% in a given year was in 2005, which was the year Bernanke became Fed Chairman. At seven years and counting, Bernanke has presided over the longest stretch of sub 3% growth ever. With a record like that, we wouldn’t expect him to pull the plug until he is extremely confident that the US economy will see 3% growth. Lower GDP in the Bernanke era is certainly a good rationale for why the Fed might hold steady on QE. But Bernanke is known for his consensus management style, and there’s growing dissent in the Fed ranks on when to wind down QE—or at least signal a wind down. Rates rose last week as bond markets were rattled by such signals. … Lacker said yesterday the central bank should reinvest the principal from its mortgage bond holdings into Treasuries. “That would be a really reasonable step to contemplate at this point given the strength in the housing market right now,” he said to reporters in Baltimore. … Fisher said in response to audience questions he wants to see the central bank’s balance sheet eventually returned to an all-Treasuries portfolio. While Fisher has been one of the most outspoken opponents to bond buying among Fed officials, he said in February he didn’t want to stop purchases “cold turkey,” which could destabilize the market. All relevant arguments for less QE (especially with respect to MBS, which directly impact mortgage rates) so it’s easy to think this counters Bespoke’s theory that QE will come “later rather than sooner.” But it actually supports it because these three Fed officials don’t get policy votes on the FOMC this year—voting FOMC members rotate (schedule) so Plosser and Fisher are alternates this year and will rotate back into voting roles next year, and Lacker won’t rotate in until 2015. So it might take until next year for Fed Exit chatter to become policy. Meanwhile, the 2013 votes indicate full tilt QE. On the surface anyway. At the May 1 FOMC meeting, 11 members voted in favor of current agressive QE policy and 1 voted against. We’ll get more details of what those voting members really think this coming Wednesday, May 22 when the minutes from that meeting are released. Market participants parse those minutes for the slightest hints of doubt coming from FOMC members who keep voting for more QE. 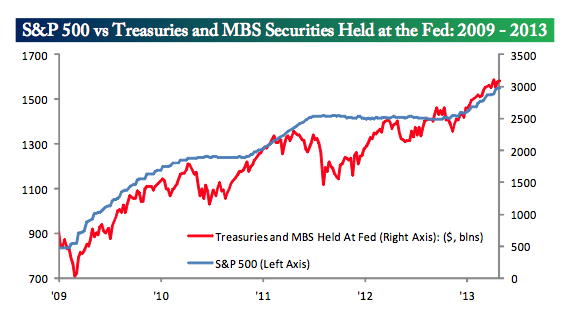 Until then, we could see more defensiveness in MBS, which means elevated rate levels.